Wanting to reupholster an existing sofa? Or the dining chair have been giving you problem and you wishes to replace the foam or fabric? 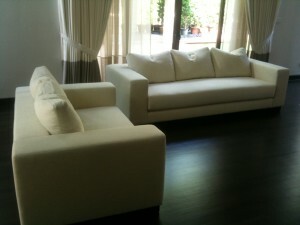 We Customise Sofa, Chairs, Cushions, Headboards (basically anything with upholstery) for your new home. Cannot find any sofa that you like off-the-shelves at shops? Be your own designer and send us your concept! We will turn it into reality! Have an old sofa or armchair that had been passed down for generations but is already worn and torn? You can give it a new lease of life by reupholstering them! Check out our gallery to see the marvels of reupholstering. Most sofas and chairs today are made in such a way that the covers can be taken out. If you are looking to change the covers, feel free to send us an email or drop by our office to get a quotation, simply by just bringing the covers or have the pictures of the existing chairs/sofas emailed to us. Replacing the covers can make a lot of difference in terms of looks. If the current covers that you have are fabric covers, why not consider changing to a leather, either synthetic or genuine, for a different “feel”? You’ll be amazed at the change it will bring to your home.